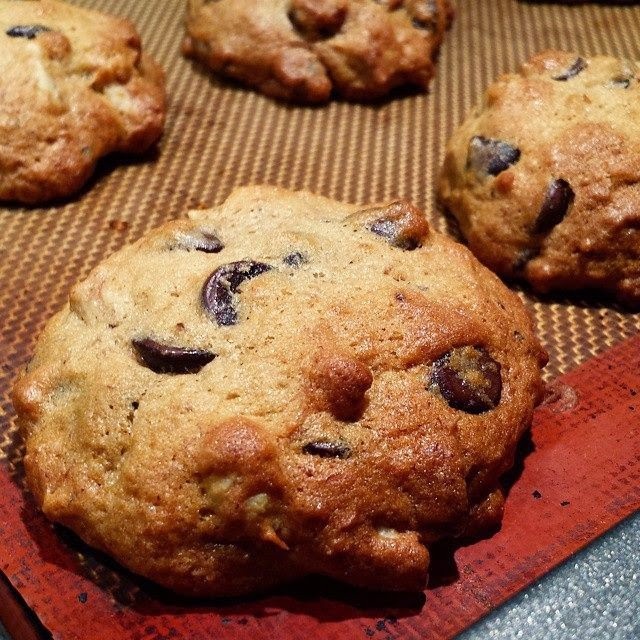 Banana bread in cookie form. I know, right? What's not to love? Don't forget to toast your walnuts, it brings out their nuttiness and makes a huge difference in the taste. Enjoy! 1. Pre-heat the oven to 350F. Line 2 baking sheets with parchment paper. 2. In a large bowl, sift together flour, baking soda, salt and nutmeg. Set aside. 3. In the bowl of an eletric mixer, combine butter and sugars. Beat until the mixture is light and fluffy. Add the egg and beat until incorporated. Mix in vanilla and bananas. Slowly mix flour mixture into the batter. Stir in the chocolate chips and walnuts. Chill dough for an hour. 4. Drop rounded tablespoonfuls of the dough about 2 inches apart on the prepared baking sheet. Bake for 12-15 minutes or until the cookies are browned around the edges. Rotate the baking sheets halfway through baking. Remove the baking sheets from the oven and let them rest for 2 minutes. Transfer the cookies to a wire rack and let them cool.